Now when professionals want to use a cordless tool for high shrubs and hedges, they have a tool as tough as they are. 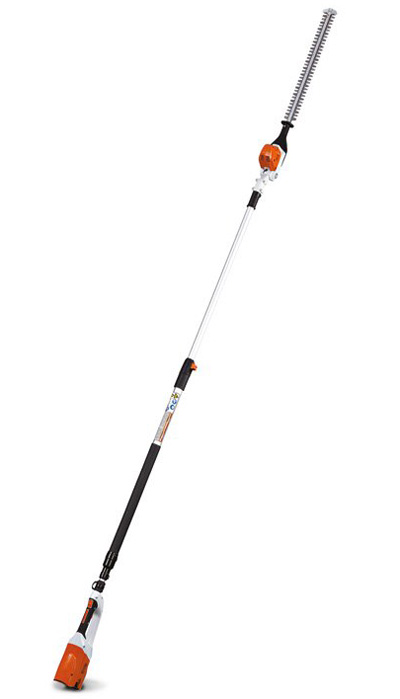 The HLA 85 STIHL Lithium-Ion extended reach hedge trimmer offers lightweight, balanced trimming thanks to its brushless, high-efficiency electric motor. Part of the STIHL battery-powered equipment line, the HLA 85 runs on the same universal battery shared by other battery-powered tools and offers long run times on a single charge (up to 11 hours with the AR 900 backpack battery) with no gradual drop in performance. Batteries & chargers can be purchased separately or as a combined set with tool. Run time may vary based on battery type, charge level and capacity, model, operating style and conditions. SHAFT LENGTH Length 8 ft. 6in. - 10 ft. 6 in. Folded Length 5 ft. 11 in.